"Just picking up a single ring-pull at over 7,000 meters could be a matter of life or death!" he said. He once spent a whole day wriggling through the ice just to pick up two oxygen tanks and a plastic cookie bag. Falling into one of the crevasses has become his worst nightmare. This year, for the first time, the team will collect the bodies of those who have died above 8,000 meters to give them a proper burial. Cering is one of China's first Tibetan climbing guides. He has climbed the highest summits on seven continents and hiked to the North and South poles. He has a master's degree in media and communications, and was the cameraman when the Beijing Olympic torch reached the top of Qomolangma in 2008. He has been to the summit four times. Cering first noticed trash scattered on the mountain during his first ascent in 2006. "Cans, chocolate, oxygen tanks, tents and sleeping bags. Their colors just don't belong here where everything should be white and blue." In 2018, Cering helped found the Mount Qomolangma environment squad. 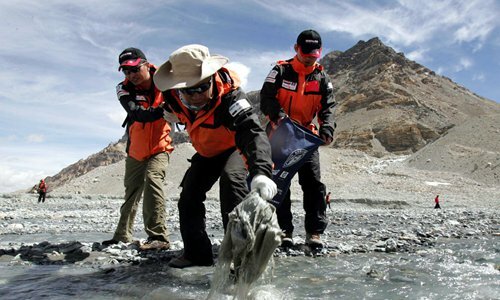 The team has carried out three major clean-ups above 5,200 meters. They collected more than 5,000 kg of food garbage, 1,000 kg of climbing equipment, and more than 2,000 kg of feces. This year, they will have to do it all over again. It is almost impossible to clear all the waste. Some of it is simply unreachable, while the rest must be gathered and put into two big containers at the camp. A single expedition can take eight hours. Trash must be treated 100 kilometers away, and the only road is a zigzagging track. Yaks, not trucks, are used to make the journey. Avalanches, blizzards, altitude sickness - working on Qomolangma is one of the most dangerous jobs on earth. The 30 cleaning squad members are mostly guides or liaison officers from the climbers' association. Dondrup is one of only three locals on the team. In the off-season, Dondrup is a doctor in Tosanglin village at the foot of the mountain, but has been working as a trash collector during climbing season for three years. "We do a lot of walking. One worker collects only 10 kilograms of garbage each day," he said. He earns 4,500 yuan (about $714) every month - not much compared with villagers working in other sectors. "I don't do it for money. My family has lived here for generations. It is my job to protect the mountain," he said. Above 6,500 meters, only professional mountaineers like Cering can do the job, and at 7,000 meters, even professional climbers face physical limits. Any unnecessary movement is risky and can cause death. At 8,000 meters, even the guides suggest climbers abandon their equipment, such as oxygen tanks, which weigh about 2 kg each. Penma Trinley, deputy director of the Tibetan Mountaineering Association, said the garbage dumped on the mountain in one year is usually removed the next. Clean-up at the mountain has improved since last year. Garbage is sorted as recyclable and non-recyclable and handed over to nature reserve administration. Abandoned equipment is carried back to Lhasa, where it is auctioned or turned into art. Tibet regional sports bureau gives two sacks to each climbing team. Everyone descending the mountain needs to carry at least eight kilograms of garbage. If their garbage weighs less, they are fined. Volunteers and amateur climbers, often suffering altitude sickness, have also done their part in picking up bottles and plastic bags. Protecting the holy mountain goes far beyond just picking up trash. New legislation has been enacted at Mount Qomolangma reserve to conserve the environment. Rules have been set for climbing, tourism, scientific exploration and engineering projects. "In Tibet, we have the bluest skies and highest mountains," Cering said. "If I could choose again, I would still become a guardian of the holy mountain."